The first in a brand-new series! Once Kate arrives, the town council members reveal that their town is on the verge of going bankrupt, and they've decided that Kate's skills and knowledge make her the perfect person to cure all their ills. The town has used its last available funds to buy the huge Victorian mansion just outside of town, hoping to use it to attract some of the tourists who travel to visit the nearby Civil War battle sites. Kate has less-than-fond memories of the mansion, for personal reasons, but to make matters worse, the only person who has presented a possible alternate plan is Cordelia Walker—Kate's high school nemesis. But a few days later, while touring the mansion, Kate stumbles over a body—and it's none other than Cordelia. 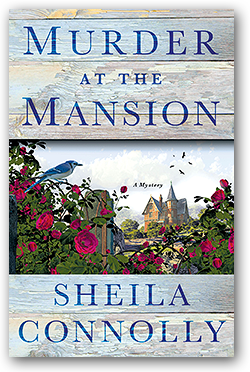 Kate finds herself juggling the murder investigation and her growing fascination with the old house, which itself is full of long-hidden mysteries. "Connolly's accomplished series launch avoids the tired tropes found in many cozy debuts, incorporating humor, a realistic setting, and well-developed, appealing characters. Fans of the author's Museum Mysteries will welcome the guest appearance of series protagonist Nell Pratt."